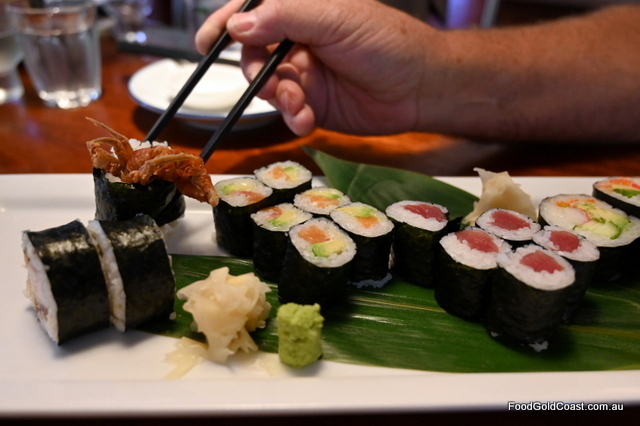 For 25 years, even before Japanese food became trendy, You Japanese Restaurant has been operating on the Gold Coast. It’s an unassuming little izikaya on the Cavill Street end of an arcade overlooking Cavill Park, the sort of restaurant frequented by regulars, or by Japanese tourists who’ve heard about it by word of mouth; a casual affordable dining restaurant, understated rather than flash or showy, but a consistent performer in the authentic food stakes. The kitchen, with a huge open servery running the length of the restaurant, lends a casual feel to the place. It focuses attention on the kitchen rather than on the dining space. Seen through the glassless ‘picture window’, its pots and pans, preparation dishes and painstaking preparation become a dominant feature. Wanting a bit of action? 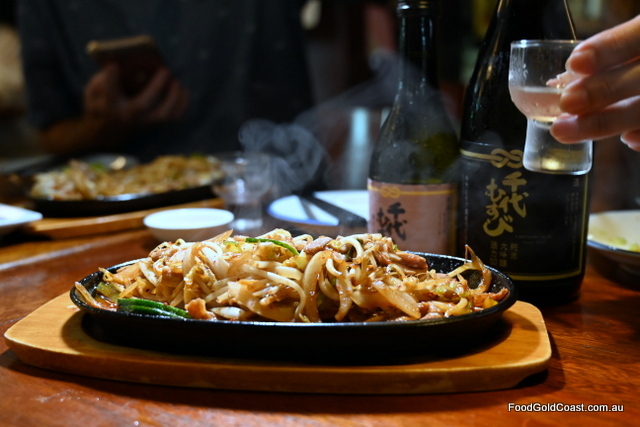 Then sit up at the bar and watch as Chef Satoshi Ono (who owns the restaurant with his wife Chiyomi), head bent, prepares your meal, or dine outside being entertained by the passing parade tottering to and from Melba’s. Satoshi studied for ten years as a chef in Japan and was credited as being a nationally qualified cooking lecturer, an award bestowed on the Dux. 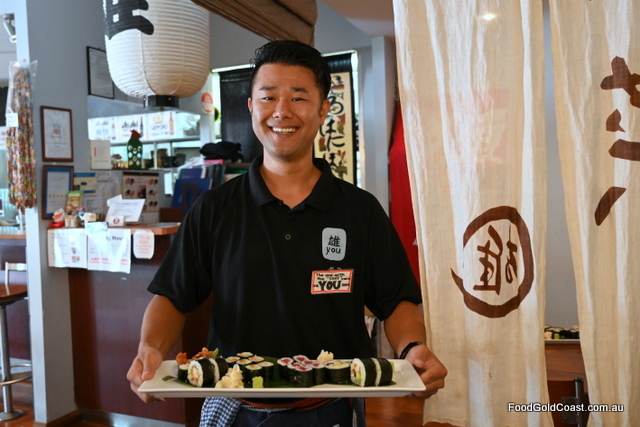 It’s a family-run restaurant with Yusuke, Satoshi’s son also working in the restaurant along with his wife Arisa, sister Chinami and Auntie Mitsuko. “Come on,” whispers the Main Squeeze. “Get on with it! I could eat a horse!” Not literally, of course, but I’m still dwelling on the drinks menu, which fills the first few pages! There’s a good selection of sake, plum wine and shochu (which I’m a bit partial to), and he’s spied the Hokkaido on tap. All’s good! A glance through the food menu shows that it’s authentic Japanese rather than Westernised, hence the steady stream of Japanese patrons! To be honest, there are some dishes which are a little beyond our reach: Grilled kingfish head, Chicken giblets, Jellyfish with vinegar, Ox tongue and Grilled Cartilage! No thanks! 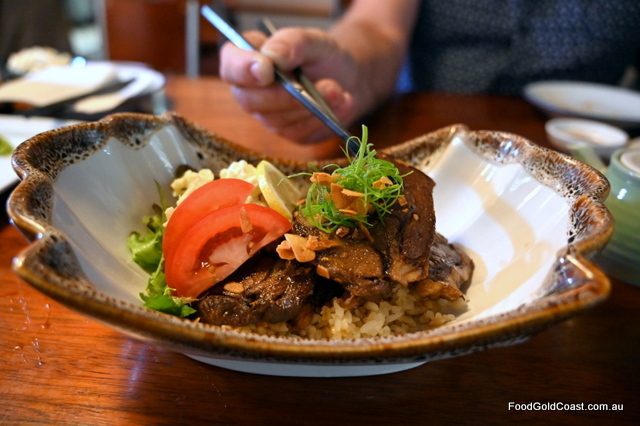 Authentic dishes such as these are displayed on the daily specials board, along with more accessible dishes for Westerners: Wagyu teppu-yaki beef, Nasu-don eggplant with miso paste, Agedashi tofu and many other izakaya bar heroes – plenty to choose from. 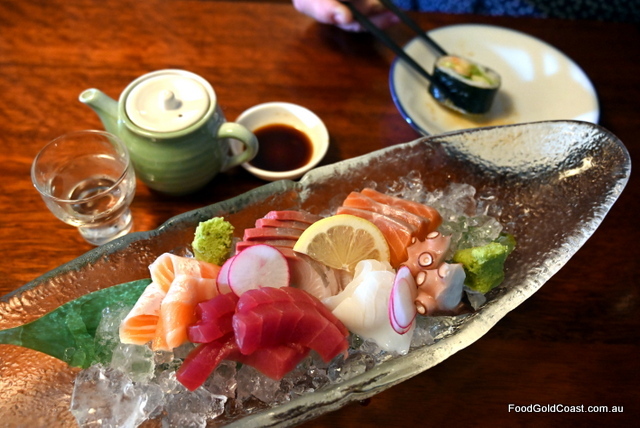 From our visits to You, we’ve established favourite dishes, light and fresh, such as the Assorted sashimi. Served on a leaf of Aspidistra over ice, it contains slices of kingfish, squid, salmon and tuna, with the surprising addition of a shiso leaf grown in the chef’s own garden! Flying in fresh fish from Sydney and Melbourne daily and even picking it up from the GC Airport themselves, you can be sure that their sashimi is the freshest you can buy. Delightful! 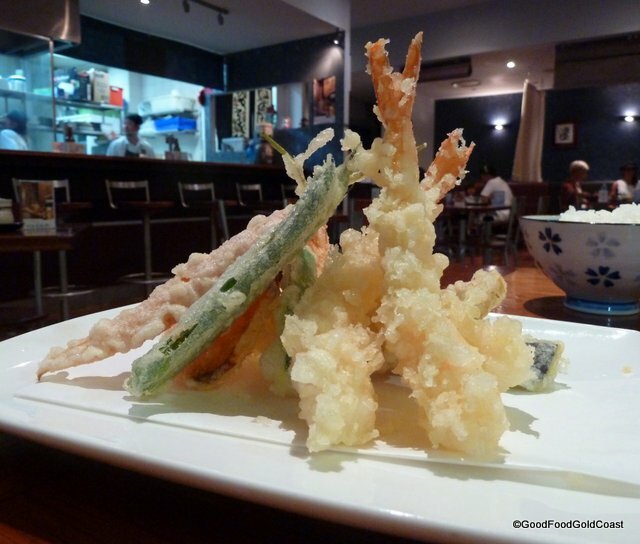 The tempura had a light and crisp batter covering large prawns and crunchy vegetables. 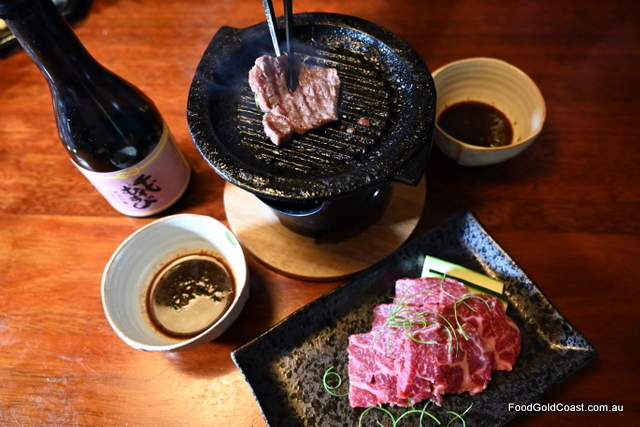 For a real treat, try the Wagyu Teppanyaki! If you avoid late nights and Schoolies,You is an easy place to enjoy yourself: authentic well-priced Japanese cuisine in a licensed/BYO venue, efficient service with a smile, the Council car park a block away; no intrusion into the city centre, in fact if you go at the right time you’d hardly know you’d been to Surfers at all! For two weeks at the beginning of December each year, You celebrates its birthday with discounts to customers. NOTE: This is an updated review, first published in 2013.